Back in the days of wireline telephony, when all phone calls went over the Public Switched Telephony Network (PSTN), businesses would purchase "trunks" -dedicated lines or a bundle of circuits - from their service provider. Today the new model of "trunking" to IP- enabled enterprises can result in lower telephony costs and a rapid return on investment (ROI) plus the opportunity for enhanced communications within the enterprise as well as with vendors, customers and partners. 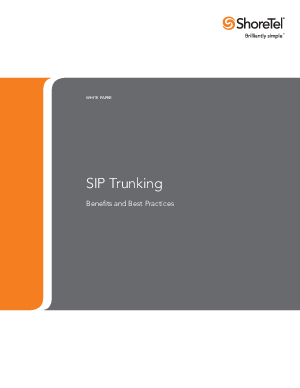 A SIP trunk is a service offered by an Internet Telephony Service Provider (ITSP) that uses SIP to set up communications between an enterprise PBX and the ITSP. A trunk encompasses multiple voice sessions - as many as the enterprise needs. While some see SIP as just voice, SIP trunking can also serve as the starting point for the entire breadth of real-time communications possible with the protocol, including instant messaging, presence applications, whiteboarding or application sharing. The possibility for a rapid return on investment is a key driver of SIP trunk deployments. Eliminates costly BRIs (Basic Rate Interfaces) and PRIs (Primary Rate Interfaces) services. Provides flexible termination of calls to preferred providers; calls to anywhere worldwide can be made for the cost of a local call. Enables redundancy with multiple service providers and links. Internet telephony or SIP trunking service provider (ITSP). The productivity benefits that come with SIP and SIP trunking are also significant. By extending the SIP capabilities of the corporate network outside the LAN, satellite offices, remote workers and even customers can use VoIP and other forms of real-time communications applications to break down barriers of geography to share ideas and increase productivity.